When on Active Service deserting His Majesty’s Service. In that he, in the field on 14th May 1916 quitting the ranks without permission and remaining absent until apprehended by No. 17/22171 Lance Corporal William Johnston 17th Bn. Lancashire Fusiliers at VIELLE CHAPELLE on 15th May 1916. Whereas it appears to me, the undersigned, an officer in Command of 106th Infantry Brigade on active service, that the persons named in the annexed Schedule, and being subject to Military Law, have committed the offences in the said schedule mentioned. I was acting C.S.M of W Company 17th Royal Scots during the afternoon of 11th May. I warned Pte. Archibald that he was a member of a Sentry Group, No. 5 Group, for the trenches as soon as the Company arrived at the trenches. At 6.30pm I was ordered by Lieutenant Spence to take charge of No.3 Platoon when the Company paraded to go to the trenches. As soon as the Company arrived in the trenches I posted Numbers 1,2,3 and 4 Sentry Groups. When I came to post No.5 Sentry Group I found Pte. Archibald was missing. I reported this to the Officer commanding W Company. When the Company paraded at 6.30pm to go to the trenches I called the Roll. Pte. Archibald was present. I belong to No.3 Platoon of W Company, 17th Royal Scots. When the Company fell in for Parade to march to the trenches, Pte. Archibald was to my left. Pte. Archibald was given a Grenade Rifle to carry in addition to his ordinary equipment. The company marched off by Platoon in file. When we got to a certain place, a Guide told us to form into small parties. Pte. Archibald was the last man of the small party in front of me and I was the first man of the next small party behind that one. My party was some yards behind the other party. We marched like this until we came to the Street Communication Trench. Here we got the order to close up and then it was that I missed Pte. Archibald. We passed word along the men, forwards and backwards, to know where Pte. Archibald was. He never turned up. After going some distance up the trench another halt occurred. We passed word along again to find out where Pte. Archibald was and the answer came back that he was not there. When I got to my Bay in the front line I reported to my Sergeant (Sgt. F. Carrie) that Pte. Archibald was missing. On 15th May at about 3pm, me and Pte. Walker (17th Lancashire Fusiliers) were walking down the La Couture Road. An old French lady called Pte. Walker’s attention to go and have a look in her Barn. On doing so I followed him. On going into the hay loft I found Pte. Archibald asleep. I then wakened him and asked him what he was doing there. I asked him how long he had been there. He said “I have been here since 10 o’clock the night before”. I asked him which regiment he belonged to and he told me the 17th Royal Scots. He said he had no Pay Book but he gave me his Identity Disc. I asked him where his Regiment was and he said it was in the trenches. On finding he was absent from his Regiment I placed him under arrest. Pte. Archibald had no equipment. He had his overcoat over him. Pte. Archibald had no Rifle with him. The Barn was near Vielle-Chapelle. I was walking along the La Couture Road on the 15th May about 3pm in the afternoon with L/Cpl Johnston. An old French lady was drawing attention to her house. I went in the house and saw Pte. Archibald lying down in a Barn. L/Cpl Johnston awoke him. He was dressed in Fatigue Dress with no equipment. L/Cpl Johnston questioned him and not receiving satisfactory answers, he took Pte. Archibald in charge. I am the Regimental Sergeant Major of the 17th Royal Scots. About 3pm on the afternoon of the 15th May I was superintending some work behind Battalion Headquarters. Captain Barry of Y Company, 17th Royal Scots told me he had found a Rifle in the ditch (pointing up the Rue do Bois) and gave it over to my charge. This was a Grenade Rifle and had a wooden tab marked “W. Coy. 17th R.Scots”. I took charge of the Rifle. When I was marching along in single file I felt queer and I don’t remember anything until I found myself near the barn. This was at night and I thought I had better go into the barn and lay down till morning. I remember nothing until I was woke up the next day. Accused calls no evidence as to Character. The following Evidence as to character was put in after the finding. To Officer Commanding 17th Royal Scots. The character (from a fighting point of view as well as from behaviour) of Private ARCHIBALD, his previous conduct in action and the period of his service with the Expeditionary Force. Your opinion based on your personal knowledge, or that of your officers of the soldiers characteristics, as to whether the crime was deliberately committed with the sole object of avoiding the particular service involved. On regards behaviour, this man was not a man who gave much trouble, neither was he in any way sense a man whom one would pick out as a good man. He is considered by his Platoon Commander to be of poor intellect, and I consider that he is a typical slum product of a low level of intelligence. From a fighting point of view, Pte. Archibald was of not much consideration. He was noted in his Company roll book as an unreliable man. He came out with the Battalion to France on 31st January 1916. His Company Commander is of opinion that the crime was deliberately committed, as the whole company knew that they were proceeding to their turn in the trenches and Pte. Archibald had been warned as one of the sentry groups to be posted on arrival in the line. In this opinion I am reluctantly compelled to concur, though I am doubtful if he realised the gravity of the offence he was committing; if this was so however it was not from want of warning as previous similar cases in which the extreme penalty has been inflicted had been brought to the notice of the men of the Battalion. To 106 Brigade. 25531 Pte. ARCHIBALD Royal Scots according to his Attestation papers is 19 years 355 days. He enlisted on 8.6.15 and gave his age as 19 years. The 17th Battalion, Royal Scots is very well conducted. It contains a proportion of rough characters and lately there has been a certain amount of insubordination especially when orders are issued for heavy work in the trenches. I am reluctantly compelled to state that I think an example is necessary in the interests of the discipline of the Brigade and am of the opinion that Private J. Archibald deliberately committed this crime. The President and Prosecutor have been informed that the evidence of R.S.M Martin should not have been accepted in its present form. Captain barry should have been called to give evidence as to the finding of the rifle. I recommend the death sentence be carried out. I see no reason against carrying out the death sentence, except the youth of the man. This appears to me to be a bad case. The man in question not only evaded duty but threw away his Rifle and Equipment. I recommend that the sentence be carried out. In confirmation of my telegram No.A (b) 1583 of today. Please note that the C.in C. has confirmed the sentence in the case of No. 25531 Private J. ARCHIBALD, 17th Battalion, Royal Scots. I certify that No. 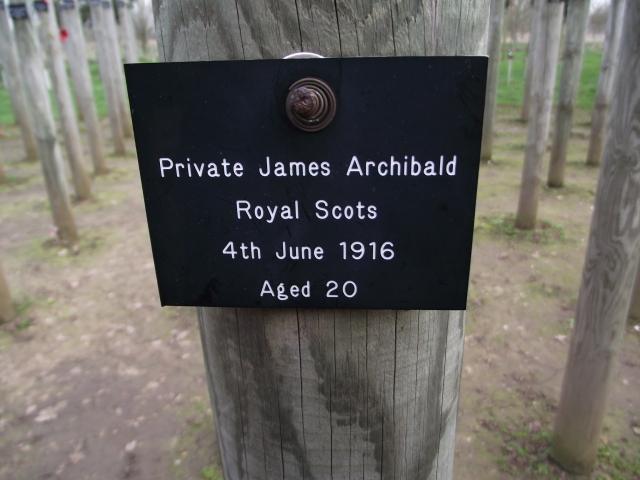 25531 Private J. ARCHIBALD of 17th Royal Scots Regiment was executed by shooting at 4.35am on 4th June 1916 at LOISNE. Death was instantaneous.